The Google Nexus 7 sports a 7 inch, 1280 x 800 IPS LCD which is equipped with a scratch-resistant Corning Gorilla Glass. The tablet packs Nividia's quad-core Tegra 3 processor along with 1GB of RAM and a 1.2MP front facing camera. In a keynote at the Google I/O conference, Google unveiled its first ever tablet, the Nexus 7. Google announced that the Nexus 7 will run on the latest Android 4.1 Jelly Bean, making it the first and only device to be running the OS. As rumored the Nexus 7 has been designed and manufactured by ASUS. Google has already started taking orders for the Nexus 7 and it is available at Google Play Store for a price of $199 for the 8GB model, while the 16GB model is priced at $249. The tablets are going to be shipped to the US, CANADA and the UK in mid-July, while other countries will follow soon. Purchasing also includes a $25 credit to be spent in the Google store. Engadget reps managed to get their hands on the Nexus 7 and here's what they found. 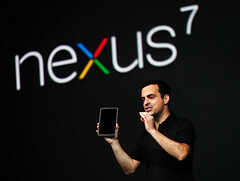 The Google Nexus 7 sports a 7 inch, 1280 x 800 IPS LCD which is equipped with a scratch-resistant Corning Gorilla Glass. The tablet packs Nividia's quad-core Tegra 3 processor along with 1GB of RAM and a 1.2MP front facing camera. The IPS panel looked good from all angles providing good brightness and contrast under bright environment. Connectivity is provided by NFC, Wi-Fi 802.11 b/g/n, Bluetooth, micro USB 2.0 and GPS. There's no MicroSD or WWAN. At 10.45mm, the Nexus 7 is fractionally thinner than the Kindle Fire but is much lighter at 340g. The 4235 mAh battery promises 8 hours usage with full HD video playback. The 8GB Nexus 7 is priced at $199 which is the same as the Kindle Fire and so both of them are bound to be compared with each other. So for comparison sake, the Nexus 7 is quicker and more responsive than the Kindle Fire, but it is obvious given the superior hardware of Nexus 7. However, the biggest difference between the two is the screen quality. Besides this, the Nexus 7 has the advantage of Jelly Bean's optimization for smaller screen tablets. Although the Nexus 7 cannot best superphones such as the Galaxy S3 or the HTC One X, but under $200, Google has come up with a great product for sure and we can expect consumers lining for it very soon.